The Bruce Peninsula of Ontario extends northward into Lake Huron, with the main basin of the lake to its west and the Georgian Bay to its east. 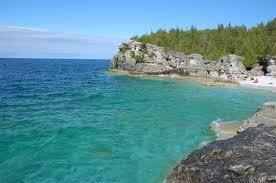 The Peninsula stretches for about 80 km and is just a few hours north of Toronto on Highway 6. The area is known for its wildlife and nature reserves, and those who appreciate the great outdoors will love the Bruce Peninsula real estate for its easy access to nature. The Peninsula is home to two national parks, a number of nature reserves, and part of the beautiful Niagara Escarpment. A small yet vibrant community lives on or near the Bruce Peninsula, which is composed of two Municipalities: real estate in the Bruce Peninsula breaks down into the Northern Bruce Peninsula and the South Bruce Peninsula. The biggest towns in the north municipality include Tobermory and Lion's Head, with Wiarton and Sauble Beach popular in the south. The Peninsula begins in the south at Sauble Beach and ends in the north at Tobermory. Tobermory is the 'Northern Gateway' of the Peninsula, where you'll find a beautiful harbor featuring ancient shipwrecks, ringed by bluffs. Lion's Head has rugged cliffs and trails for hiking, with launch points for boats and kayaks.